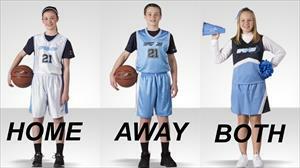 Each year, young athletes in Upward Sports Leagues are excited to receive new uniforms. We know that parents, coaches, and league directors love them too, because every year, one of our most frequently asked questions is "What are my uniform colors?" Well here they are for your 2018-2019 Upward Basketball and Cheerleading League in Greenville, NC. This year HOME will be WHITE and AWAY will be BLUE.